Oct. 7, 2015, screen shot of Vemma.es by PP Blog. 3RD UPDATE 4:11 P.M. EDT U.S.A. 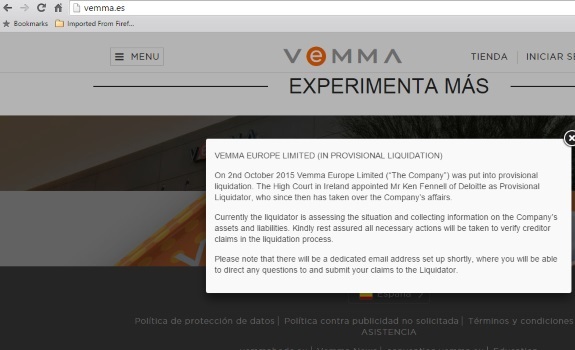 There is a Twitter report in Spanish dated today that Vemma Europe Limited has been put in “provisional liquidation” and that the High Court of Ireland has appointed a provisional liquidator to verify claims. The FTC sued Vemma in August. Robb Evans & Associates, the former receiver, is now the court-appointed monitor in the FTC case — as the agency and Vemma continue to clash after a federal judge allowed it to reopen last month but put it under severe restrictions. See Oct. 3 story at BehindMLM.com. Tags: Deloitte, High Court of Ireland, Ken Fennell, Vemma, Vemma Europe Limited, Vemma Europe Ltd.